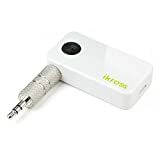 iKross Universal Wireless Stereo Transmitter is a compact, transmitter that connects with any 3.5mm stereo jack to provide wireless convenience. The stereo music from your MP3, PC, TV and other devices can be transmit wirelessly to your Bluetooth enable devices/receiver. Built in with a rechargeable Li-ion battery, this transmitter can be used for 8 hours on a single full charge. Additionally, you may safely leave the power supply plugged into the transmitter at all times. – Charging and working in parallel (with no static noise) is supported. – Supports A2DP, enabling your audio device to transfer stereo audio wirelessly. – Built-in rechargeable battery could last up to 8 hours. -Power on/off button. It will automatically turn off within 5 minutes after disconnected from device. -Transmits up to 33 feet away. -LED charging and pairing indication. This entry was posted in Computer Desktops and tagged 3.5mm, Audio, Audioout, Bluetooth, Desktop, Devices, Dongle, enable, iKross, Jack, Player, Stereo, Tablet, Transmitter by Express Computer Supplies. Bookmark the permalink.